A fire that broke out Monday morning aboard the K-150 Tomsk nuclear-powered submarine of Russia’s Pacific Fleet, which was undergoing maintenance works at a dock near Vladivostok, has been stabilized, according to anonymous naval officials speaking with the state run news agencies. That the fire is out has yet to be independently confirmed by non-state media. According to Russian state media reports, the Tomsk caught fire while being repaired at a floating dock at the Zvezda shipyard in Bolshoi Kamen, about 25 kilometers across a bay from Vladivostok on the Sea of Japan during welding works, Russian state media reports said. Russian naval officials speaking anonymously with various state newswires Monday said there were no fatalities, that there was no danger of a radioactive leak from the vessel’s reactor, and that there had been no weapons aboard the submarine when it caught fire. They also noted that there had been no crew onboard at the time of the blaze. The Unified Shipbuilding Corporation website said in a statement (in Russian) that the fire broke out in a ballast area of the submarine after a gas-powered saw was used to cut through a grate, setting an old rubber covering, cables and paint on fire. Grigory Pasko, a former naval journalist for the Russian Pacific Fleet, could not confirm that the site’s information was independent, though the information it cited was corroborated by an anonymous naval official who spoke to the state-run RIA Novosti. Accordign to a Facebook post by Pasko, the Tomsk has been at the shipyard awaiting repairs for five years. RIA Novosti went on to report quote the source as saying 13 firefighting units from the Pacific Fleet and the Emergencies Ministry had arrived at the scene to put out the blaze. The official told the newswire there was little danger of an explosion because the cistern is outside the sealed body of the submarine where the reactor is located. “The situation is being monitored. However, we can already say that the situation has improved, and the smoke is subsiding,” the naval source told RIA Novosti. “There is no threat of radioactive contamination,” Itar-Tass, also state-run, cited an unidentified official in Russia’s Pacific Fleet command as saying. “The weapons have been removed from the submarine. The situation is completely under control. There is no threat to residents of the city,” Itar-Tass quoted the official as saying. None of the official sources indicated the exact duration of the blaze. 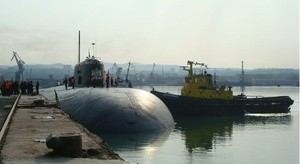 The Tomsk, a Delta IV class submarine, is capable of carrying 24 guided nuclear missiles, Itar-Tass reported. Alexander Nikitin, chairman of the Environment and Rights Center (ERC) Bellona, who is also a former Russian submarine captain, said the missiles aboard the Tomsk were of the P-700 Granit variety, a long range missile capable of being fitted with nuclear war heads. It is yet to be confirmed by independent sources that the missiles had been removed before the blaze, cause by a welding accident, when the blaze broke out. Calls to the Pacific Fleet Command’s press office by Bellona were not immediately returned. Nikitin said it would be standard practice to remove weaponry previous to repairs. A fire swept the Yekaterinburg, another Delta Class submarine in Northwest Russian in 2011 after a welding accident in Ruslyakovo, near Murmansk. The Navy reported that the Yekaterinburg’s weapons had been removed, but a subsequent investigation of photographs of the wreckage by Bellona and statements by a deputy prime minister later revealed that claim to be untrue. Some 19 people were injured battling the blaze aboard the Yekaterinburg, and the fire took hours to extinguish because of smoldering within the sub’s rubber sound insulation hull – even after officials took the drastic measure of submerging the subs to extinguish the flames, which were reportedly seen from a dozen kilometers. The fire was ignited when careless welding works ignited a wooden scaffolding constructed around the vessel for repair works. Negligent welding works also igniting a wood scaffolding around a submarine that was undergoing decommissioning in 2002 at the Sevmorput shipyard north of Murmansk. The fire in dry dock on the Echo-II class submarine was similarly exacerbated by the rubber sound insulation hull. The Northern Fleet experienced another fire aboard a nuclear submarine in 2006, this one at sea. The Svyatoi Daniil Moskovsky Victor Class III submarine experienced a fire that killed two. Naval command at that time admitted that the submarine was long overdue for maintenance and safety checks, and implied that the two sailors who died may not have had mandatory breathing apparatus that is standard issue to all submariners. The Tomsk fire is not the only accident the Russia Pacific Fleet has dealt with in the last 10 years. In 2008, some 20 people died and another 21 were injured during sea trials of the Nerpa submarine when the vessels fire suppression system was accidentally tripped. The submarine was carrying 208 people at the time of the accident, more than three times the crew it was designed for. The overcrowding on board was due to the combination of the Russian navel crew as well as observers from the shipyard that had built the vessel. The accident was called by naval officials at the time the worst submarine accident since the sinking of the Northern Fleet’s Kursk Oscar class submarine, which went down after a torpedo exploded in its compartment during naval exercises in 2000. The Nerpa was eventually leased to the Indian Navy. On August 10, 1985, in the most notorious Pacific Fleet accident, the Project 671 – Victor-I class submarine K-314 was at the Chazhma Bay naval yard outside Vladivostok for refueling. The submarine’s reactor went critical during the refueling because its control rods had been incorrectly removed when the reactor lid was raised. The ensuing explosion led to the release of large amounts of radioactivity, contaminating an area 6 kilometers long on the Shotovo Peninsula and the sea outside the naval yard. Ten people working on the refueling of the vessel died in the accident. The damaged reactor compartment still contains its nuclear fuel.